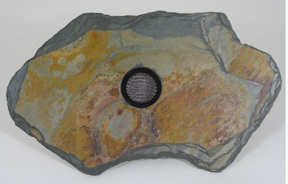 Slate Size: 8" - 10"
Beautiful 8" to 10" Slate Vase, includes a permanently attached Kenzan Pin Frog. Each Slate Vase is carefully hand sculpted in the beautiful Pacific Northwest by a Local Artist. Carefull attention is given to our Sculpting Process to ensure the layers of formation are exposed. Slate takes hundreds of thousands of years to form, and some pieces may even be up to one million years old! Color #18 Rust / Orange / Gold with Multi Colors shown. NOTE: The "Add" amounts shown for the CASE SPECIAL only adds the amounts necessary to arrive at correct total pricing. Example: 1 vase = $79.95. CASE SPECIAL = $900 ($820.05 + $79.95 = $900.00 Total).